Through a coordinated effort, all 216 _ buildings on Penn’s 302 acre campus dim: window blinds are shut, lights in offices and hallways are turned off all together, computer screen brightness is lessened, unused appliances are unplugged, and most importantly, air conditioning units are strategically cycled-off. The savings from one person’s working space are multiplied many times over and allows Penn to use resources in better ways—which is awesome when you consider what other things (like Financial Aid) are funded by the simple act of thousands of people at Penn turning off a light switch. Considering this, I don’t mind sending emails (or writing a blog post for Frankly Penn) in the dark. 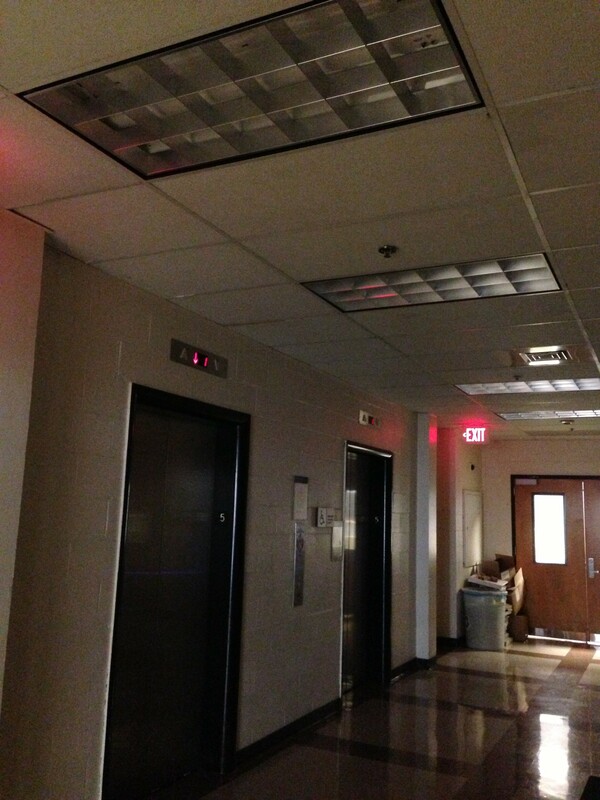 Our hallway in the Franklin Building…Even the elevators seem more subdued somehow.